Authentic Seville Marmalade from Ojai, California. In fond memory of Mr. Francis Bailey (Bill) Vanderhoef Jr. who provided this, his signature recipe, by way of the daughter of Bret Harte, famous writer of western stories. The charm of this recipe is not only its fabulous taste but the story behind the recipe. This recipe is distinctive because it is made from freshly picked oranges of some of the few surviving Seville orange trees in Ojai, California and it is a recipe dating back to at least 1920. Writer Bret Harte's daughter may have obtained the recipe from someone else but of that we have no record. In her later years, Ms. Harte was better known for appearing at the post office in the center of town without a stitch of clothing and her car parked in the middle of the street. Must have been a wondrous sight indeed. 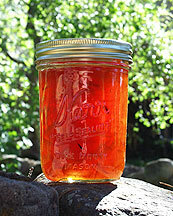 Prior to those events, Ms. Harte shared her recipe in the late 1940's with friend and long time Ojai resident Mr. Bill Vanderhoef who planted some of his own Seville orange trees on his own property and every year makes and jars several batches of this thick, rich and wonderful marmalade. We are fortunate that he is also generous with this recipe to which he has added his own tweeks. This recipe surpasses any other marmelade we have ever tasted. 1. Wash the oranges and lemons using an environmentl wash.
2. Cut the oranges and lemons in half then scoop our the pulp with your thumb or large soup spoon and place the pulp in a large enamel pot. Set the skins aside and reserve. 3. Add 10 cups clear, fresh water to the pulp. 4. Cut the skins of the oranges and lemons into very fine slices. Put all the skin slices into another large enamel pot and add 23 cups clean, fresh water. 5. Boil both pots vigorously for one hour. Then set aside and let cool fully. 6. Take the pot with the slices of the skins and stretch the cheese cloth over the top tying it firmly in place with the string. 7. Pour the contents of the pulp pot onto the cheese cloth and let it drain through into the skin mixture until it stops dripping through. This may take some time, possibly 2-3 hours. You want the pulp to become almost dry. 8. Remove the cheese cloth with the pulp and discard the pulp and the seeds. Let the pot stand over night. 9. The next day, bring the combined mixture to a boil and add the sugar. Boil rapidly being sure to stir constantly to make sure the sugar does not burn on the bottom. You can add a teaspoon of salt if desired. 10. Sterilize the jars in a 225 degree F. oven for the last half hour prior to filling. 11. Pay close attention to the boiling mixture. The mixture will become thicker and thicker and it is easy to over cook or burn it. 12. You can test for thickness by putting a bit on a spoon and chill it rapidly by placing in the freezer then, when it is cooled by this, test for desired thickness. 13. When it is as thick or as runny as you desire, ladle into the sterilized jars and seal immediately. If you over cook, it will become too dark. This marmalade is great on bread and butter, over ice cream, on chicken dishes...the imagination is your only limit!